I don’t make a lot of soup, but when I do, I want it to warm me up from my head to my toes. This bowl of deliciousness was created for two reasons. First off, I wanted to make a recipe for the Whole30 and OMGhee mystery box challenge on Instagram. The challenge was to create a Whole30 approved recipe using apples, parsnips, and OMGhee butter. The second reason, was because I ran myself into the ground this past week and I really needed a meal that would help with my Saturday of R&R. And a creamy, hot bowl of soup definitely fit what I had in mind. I had actually been thinking of things to make for this mystery box challenge while working in San Francisco this week. My parents happened to be housesitting for my brother and we overlapped for one night, so my mom and I were brainstorming recipe ideas. We were thinking of things like muffins and flourless cakes, when I realized that those did not fit the criteria of being Whole30 approved. So, scratch those ideas and I still wasn’t quite sure what I wanted to create. But I knew I wanted to have bacon in it some how and I love the crisp and tart flavors of Granny Smith apples too. Funny thing happened, I got like zero sleep in SF during my stay for multiple reasons. And I totally overdid it with training and tennis when I got home. Recipe for disaster when you push your body too hard physically, while running on fumes. So I decided to wait until I got a good night’s sleep in my own bed and then see what my brain came up with to make. I hope you try this comforting soup and enjoy it on a day when you feel like curling up on the couch with a blanket! Once veggies are roasted, take out and let cool a few min. Then you can puree in a high powered blender with the chicken broth and coconut cream until very smooth. Or you can use an immersion blender in a stock pot with the broth and coconut milk. 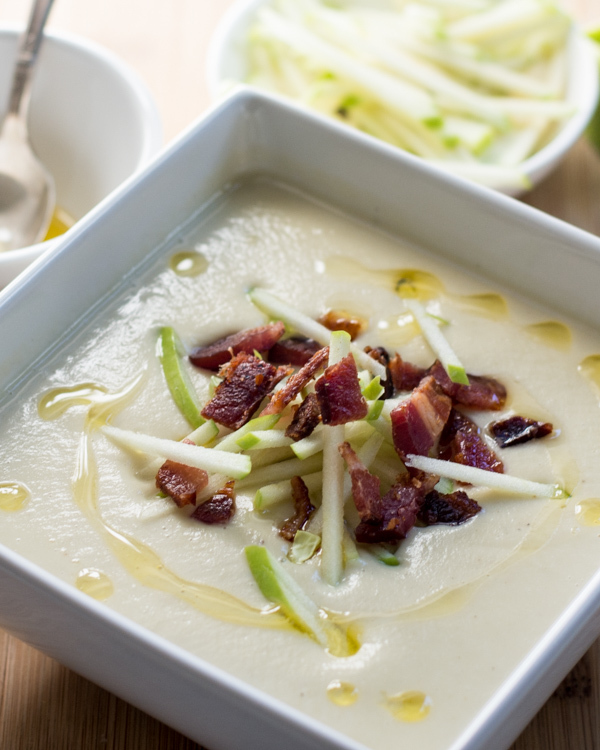 Top with a drizzle of melted ghee, chopped bacon, and apple matchsticks. Enjoy as an appetizer or large bowl for main course!